Here's a villain that will dampen your spirits - and everything else. When ship worker Morrie Bench was accidentally exposed to a combination of radiation and rare gasses, he was transformed into Hyrdo-Man! Able to turn his body into a water-like substance and project powerful blasts, Hydro-Man chose to use his new abilities for a life of crime. Moving through small holes and cracks as easily as water, burglaries and other thefts became simple, and traditional jails couldn't hold him! Defeated by Spider-Man on several occasions, Hydro-Man has been known to team-up with other super-villains against Spidey. Everyone was disappointed in the version of Morrie released in the Spider-Man Classic line - after a string of great villain figures, this one completely screwed the pooch. Luckily, this is an easy custom. One of the benefits of Jakks Pacific using and re-using only a few stock bodies for their wrestling figures is that pretty much every piece is interchangable with every other piece. 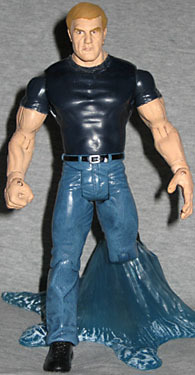 This Hydro-Man started life as a Rock figure from 2003 in the "Off The Ropes" line: I was just looking for anyone wearing a t-shirt and jeans, but they were even the right color. His head and left hand came from Classic Superstars series 13's Killer Kowalski: the original hand was that half-gripping pose that so many Jakks figures have, and I wanted Morrie to be able to have some better gestures. The WWE figures are in a 7" scale, rather than the 6" scale of the SMC line, but that actually turned out not to be a problem - Hydro-Man is still ¼" shorter than Sandman, the character he was created to rip off. An extra display base from Namor makes the perfect accessory. Who'd win in a fight, Sandman or Hydro-Man? Tell us on our message board, the Loafing Lounge.